The McArthur Public Library's mission is to connect the Biddeford community with materials, programs, services, and informational and cultural resources needed to lead fuller, better, and richer lives. Biddeford was one of the first cities in Maine to enjoy public library service; its first library opened in October 1863 as a city department and occupied a room in the City Building. When the City Building burned in 1894, the Mayor recommended that a private association assume the responsibility of maintaining a public library for the benefit of the city’s residents. With seed money willed to the association by Elizabeth Stevens, a retired employee of the Laconia mills, and the energy of Robert McArthur, an Agent of the Pepperell mills, the association bought the former Pavilion Congregational Church at 270 Main Street and dedicated the McArthur Library in October of 1902. Robert McArthur himself was an immigrant who started working in a Rhode Island mill as a youth. He was a self-educated man whose belief in the importance of a public library to provide all citizens with opportunities for advancement was so strong that he gave both the funds to purchase the library’s current home and monies to provide for its maintenance—a gift that was repeated by both of his daughters, Jane Owen and Lena McArthur. The City of Biddeford’s continued annual support of the library and its services means that McArthur Library is one of the oldest tax-supported libraries in New England, and the oldest in the state of Maine. Thanks to the City, the McArthur family, and other generous supporters, McArthur Library now offers community members access to more than 59,000 printed volumes, over 7,000 e-books and 4,200 downloadable audiobooks, 100 magazine subscriptions, and an extensive audio-visual collection of more than 9,000 items including audiobooks, music CDs, and DVDs . We also have more than 20 public access computers with the Internet, literacy software, and free wireless Internet access throughout the building. A treasure unique to McArthur Library is our glorious collection of antique photographs of the city and surrounding areas. We offer year-round weekly story programs for infants through preschoolers at no charge, and in the summer we add our now-legendary Summer Reading Club for school-age kids and teens to our services. Our recently acquired laptop lab has been used for hands-on classes for both adults and kids in computer basics, Internet searching, and access to electronic resources provided by both McArthur Library and the state of Maine. A library is more than a big building with books in it. We’re a big building with books and a staff that’s eager to connect you with those books, plus the music, movies, and information you need. Have you read everything by your favorite author and need some ideas to tide you over while you wait for the next one? Ask us—we’ll point you to some good ones. Do you want to sample some new (or old) tunes before you commit to buying them? Check out our CD collection. Do you have a long commute to work? Enjoy the time with an audiobook—really, when was the last time someone read to you? Are you trying to settle a bet? Call us up—284-4181—and we’ll do our best to find the answer to your question; you don’t even have to come in (though we’d love to see you). McArthur Library is located on Main Street in Biddeford, just a half a block east of the intersection of Main St. and Elm St. (Rte. 1). It is in a converted church and has a wrought-iron fence that fronts the sidewalk; it is the only building on this part of Main St. that has a lawn in the front. street is free for up to 2 hours; you may also park in the lot opposite Biddeford Savings, and we will validate your ticket for one hour of free parking. Take the Maine Turnpike to exit 36 (formerly exit 5) in Saco, to Interstate 195. Take exit 2A from I-195 to Rte. 1 going south. At the intersection of Rtes. 1 & 9, Rte. 1 bears to the right; stay on Rte. 1 and follow it south into Biddeford. Look for the second traffic light after passing under the railroad trestle; this is where you will make a left onto Main St. The library is 1/2 block up on your left. Parking on the street is free for up to 2 hours; you may also park in the lot opposite Biddeford Savings, and we will validate your ticket for one hour of free parking. When the City Building burned in 1894, the Mayor of Biddeford recommended that a private association assume the responsibility of maintaining a public library for the benefit of the city’s residents. 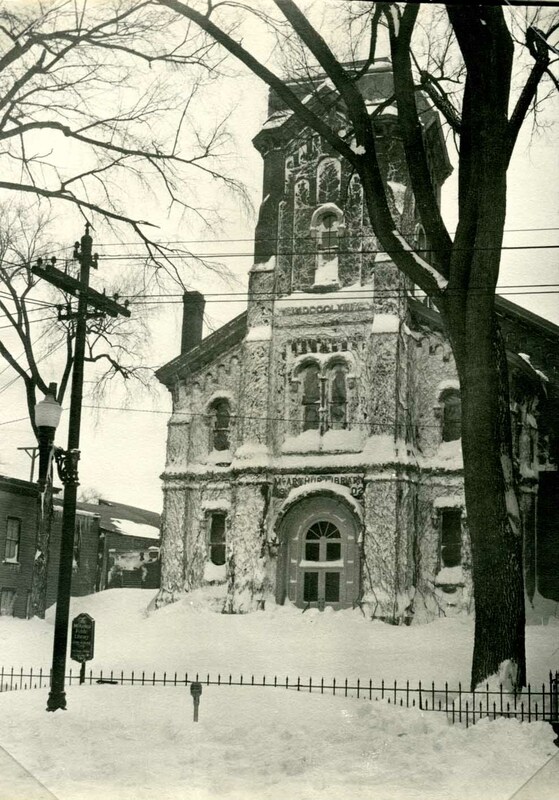 In 1902, with seed money willed to the Association by Elizabeth Stevens, a retired employee of the Laconia mills, and the energy of Robert McArthur, an Agent of the Pepperell mills., the Libary Association bought and dedicated the former Pavilion Congregational Church at 270 Main Street as the McArthur Public Library.